The Walden Soundscape is a project funded by a Graduate Center Provost’s Digital Innovation Grant. 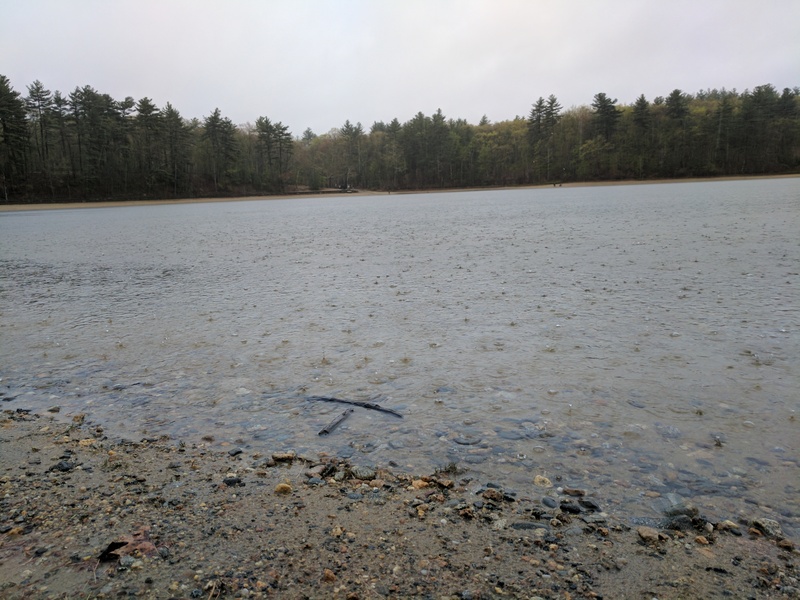 It’s my effort to share the sounds at Walden Pond with any interested reader of Henry David Thoreau’s Walden in the form of an immersive website experience. I’m recording sounds at the pond in all four seasons, taking photographs, and creating companion videos. On the website you can now take a stop-motion animated walk around the pond in winter and (soon) spring. I’m also mapping the sounds of passing trains at different points around the pond to measure the impact trains have on bird song. This project calls attention to the musicality of Thoreau’s philosophy and writing in companionship with my dissertation on the impact of sound and sonic vibrations on the American Transcendentalists. They were interested in maintaining harmony with nature and understood music to be both a spiritual and physical experience. On a cold day in February, I set out with my partner and two friends to walk around Walden Pond just after a blizzard. The snow was clinging to the trees and there were fresh tracks from cross country skiers on the trail. Getting to Massachusetts post-snowpocalypse had been wearisome: our flight was cancelled and train tickets were steep but we made the trek from New York to Boston in one piece and I was finally able to walk the perimeter of the pond. Snow still stuck to the branches and pine needles, and every four steps I took a photo of my view ahead. I decided to keep the images vertical because when we look out we need to turn our heads to see more peripherally; I wanted to call attention to the limits of viewing and the beauty of listening laterally. This video wasn’t the initial focus of the project but I wanted to increase the feeling of immersion at the pond and include more audience members. A friend from the Graduate Center’s New Media Lab mentioned that it would increase accessibility. Sold! So there I was, taking photos every 4 steps of 1.7 miles. I greeted oncoming hikers and stepped aside so they could pass, put on my mittens because it was cold, and took a brief break in the middle when my phone battery died! After marking my spot, we had some delicious clam chowder in Concord and I returned to collect sounds of birds, the train passing, and finish taking photos. In the end, I had over 750 photos to edit when I got home. At first it was so quiet that I worried I wouldn’t be able to hear any birds at all…but this was winter and the quietness was exactly what I should be recording. Wind was sometimes a problem even though I have a wind muff but I was able to use my body to shelter the microphone. My own sounds were also a problem because it was cold and I had the sniffles. Ironically, every time I wasn’t trying to hear the trains go by they went by and every time I had my recording equipment out, they didn’t. But I did collect a good siren or two. I did all of my sound editing as part of my graduate research in the New Media Lab. Once I uploaded the sound files to Adobe Premier Pro, I started breaking up the audio into shorter sound bites, labeling them (e.g. “leaves,” “two birds,” and “siren”). Learning to fade in and out of different bites and dividing different kinds of sounds (e.g. birds and sirens in the foreground and footsteps and leaves rustling in the background) into separate tracks helped me compose the audio into a wintry soundtrack. The polyphony of natural soundscapes lends itself well to being divided up in this way. There was always the low hum of traffic in the background but I didn’t manipulate the tracks beyond raising and lowering the volume. The hardest part of sound editing was getting rid of my own sounds but I used rustling leaves and branches to help me out. The hardest part of photo editing was keeping the whiteness of the snow between photographs somewhat even; it often didn’t match in brightness or tone between shots. One patch of snow would have a blue hue and the other a red one, and it was rare to get the same brightness between two images. I eventually edited all 750 photos in Photoshop, which took several weeks. I wanted to keep the integrity of shadows in the trees, but even after editing each photo individually, the video still has some irritating but lovable imperfections. My favorite sound that I collected was that of a blue jay singing and then flying up into the branches of a tree. Toward the end of the video in the credits you can hear the wings fluttering. That sound was absolutely magical. I’ve just embarked on another trip to Walden Pond to do some springtime recordings and just received permission from the state park to make an early visit to the pond to record the dawn chorus in the morning. Unfortunately (and fortunately) I’m getting caught in some serious weekend rain! Stay tuned for the next update.